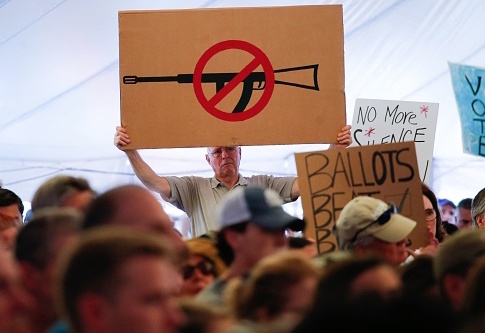 American gun-control advocates and Democratic politicians took to social media to celebrate New Zealand's plan to ban and confiscate many semiautomatic rifles and magazines on Thursday in the wake of the deadly Christchurch mosque attack. New Zealand's plan involves banning the sale and possession of any semiautomatic rifle or shotgun capable of accepting a magazine that holds more than five rounds of ammunition. Those who own such firearms would have to turn them in to police during a yet-to-be-determined buyback period or face criminal prosecution, fines, and jail time. The policy further restricts gun ownership in the country, which has a small number of gun owners. State officials enjoy wide authority to deny or revoke gun ownership licenses, which are required to purchase or own firearms. A number of leading Democrats in Congress tweeted their support for New Zealand's actions. "‘Every semi-automatic weapon used in the terror attack on Friday will be banned. This legislation will be drafted and introduced in urgency,'" Rep. Ted Deutch (D., Fla.) tweeted. "Not thoughts. Not prayers. Action." "See," Senator Chris Murphy (D., Conn.) said of the confiscation plan. "It's not that hard." "Q: How did New Zealand ban assault weapons 5 days after a mass shooting?" Rep. David Cicilline (D., R.I.), chair of the Democratic Policy and Communications Committee, asked. "A: Their politicians aren't bought and paid for by the gun lobby." A number of Democrats who have either announced their campaigns for the 2020 Democratic presidential nomination or suggested they might run also praised New Zealand's latest gun laws. "This is what real action to stop gun violence looks like," Sen. Bernie Sanders (I., Vt.), who is currently one of the frontrunners for the nomination, said. "We must follow New Zealand's lead, take on the NRA and ban the sale and distribution of assault weapons in the United States." "This ban was announced while I was at a #SanFrancisco vigil mourning the #NewZealand victims. A solemn crowd cheered," he tweeted. "For we know our mourning is empty if it’s not followed by action. Banning assault weapons is action. #EnoughIsEnough"
"Under @jacindaardern's leadership, New Zealand has banned assault rifles and military-style semi-automatic weapons just six days after the Christchurch mosque attacks," she said. "Public servants didn't stop at offering thoughts and prayers. They chose to act." Leaders of the gun-control movement in the United States were no less effusive in their praise of the gun-confiscation plan. "It took New Zealand six DAYS to enact stronger gun laws after a mass shooting tragedy," Shannon Watts, head of Moms Demand Action, said. "It's been six YEARS since a man armed with an AR-15 slaughtered 20 children and six educators in an American elementary school." "Six," John Feinblatt, president of Mayors Against Illegal Guns and Everytown for Gun Safety, tweeted. "That's the number of days it took New Zealand to take action after Christchurch—and the number of YEARS Americans have been waiting for a decisive federal response to Sandy Hook."